The apostle Paul has, in the letter to the Galatians, sought to prove the legitimacy of his gospel. Jewish false teachers have spread the seeds of their false gospel throughout the congregation. Apparently, part of their tactic was to undermine Paul’s apostolic authority. The legitimacy of Paul’s apostleship and the legitimacy of his gospel are inseparably intertwined. If Paul is a false apostle, his gospel is false. If his gospel is false, he is a false apostle. However, if either his apostleship is legitimate, his gospel is necessarily true. The same goes for his gospel. Galatians 1:11-2:14 consists of a defense of his apostleship which is by implication a defense of the gospel. Beginning in Gal 2:15, Paul engages in his explicit argumentation for the gospel, especially justification by faith in Christ alone. This statement is reminiscent of the solemn utterances given to the Corinthians (1 Cor 12:3; 15:1; 2 Cor 8:1; cf. Rom 1:13; Eph 1:9; 1 Thess 4:13). In all of these statements the verb gnorizo occurs so as to convey emphasis on what follows. It is as if to say, ‘Listen brothers, you need to know this.’ The point of v. 11-2:14 is to justify both the gospel Paul preached and his position as a Christ ordained apostle (v. 1). The validity of both the gospel and Paul’s apostolic authority are inseparable. Hence, should Paul justify his ministry and acquit himself of any question of his office, his gospel would be upheld. 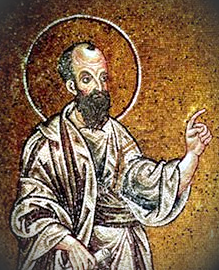 Following, Paul calls the Galatians adelphoi, indicating that he still considers them believers despite the fact that they were speedily deserting both himself and the gospel of Christ. Evidently, Paul feels that the Galatians may be persuaded to disavow the false gospel just as quickly as they took it up. Although the occasion for this letter is troublesome to Paul and dangerous to the Galatians, Paul doesn’t hide his compassion. The phrase translated by the ESV “the gospel that was preached” uses both the nounal form of gospel (euangelion) and a verbal form (euangelisthen). Robertson translated the phrase, “the gospel which was gospelized by me.” Or more loosely, ‘the good news that I evangelized you with.’ (cf. 1 Cor 15:1; 2 Cor 11:7). The gospel Paul preached was not man’s but Christ’s—it was ouk kata anthropon—"not according to man.” This statement is not a denial of Jesus’ authentic humanity, but rather, Paul is here emphasizing the fact that the gospel he preached was from God the Son. Paul is pleased to clearly articulate both the deity and pre-existence of Jesus (Rom 8:3; 1 Cor 8:6; Titus 2:13) and the humanity of Christ (Rom 1:3; 1 Tim 2:5). In Romans 9:5 Paul has no quibble with characterizing Jesus as the one who is an Israelite “according to the flesh,” and at the same time “God over all.” Thus the gospel that the Galatians were rejecting was not merely the good news offered by Paul, but also the one that originated from the Creator God himself. Paul clearly was contrasting the way he received the gospel from the normal pattern of catechetical instruction commonly practiced in rabbinic Judaism. In that system the citation of venerable sources and the piling up of numerous “footnotes” were integral to the learning process: Rabbi so-and-so says this, but Rabbi so-and-so says that, and so forth. Paul here claimed an unmediated divine authority for the gospel he proclaimed, an assertion that would be utterly preposterous were it not true. Just as Jesus confronted the scribal traditions of his day with his univocal “but-I-say-unto-you” pronouncements, so Paul confounded his opponents by stressing the unilateral and vertical character of the revelation he received from the risen Lord Jesus Christ. Paul was unlike the other apostles in that he was untimely born (1 Cor 15:8), having met the resurrected Lord on his way to persecute Christians (Acts 9:3-8; 22:6-15; 26:12-18). Apparently, Paul received his theology and doctrine directly from Jesus in an instantaneous revelation (apokalypsis). The phrase “through a revelation of Jesus” implies that the gospel Paul received was given to him during the moments he spent Jesus on the road to Damascus. Perhaps this overload of information is what Paul was considering during three days he spent without sight (Acts 9:8-9). That is not to say however, that Paul did not have other visions and receive other revelations from the Lord (2 Cor 12:1). Paul had an extraordinary upbringing. He was from Tarsus, the wealthy capital of the province of Cilicia, which resides in modern day Turkey. Paul had citizenship both in Tarsus (Acts 21:39) and Rome (Acts 22:25-28), and it is likely that Paul came from a family of tentmakers, as tentmaking was the trade which he used to occasionally support himself (Acts 18:3). Drane noted that “all students of the Torah were expected to have a practical trade as well as doing their studies.” Paul, a Jew of the diaspora, came from a family that could afford to send him away to Jerusalem to be trained by the leader of the Sanhedrin, Gamaliel (Acts 22:3; cf. Acts 5:34). Gamaliel was the grandson of Hillel, one of the most notable rabbis of all time. Paul was undoubtedly given a rigorous education in Judaism, and he gained prominence among the chief priests. Paul, then Saul, had been commissioned by the chief priests in order that he might persecute the church, arresting and even voting for the death penalty for Christians (Acts 26:10). The Pharisees represented orthodox Judaism, with its devotion to the law. Their popularity, and their general, though not universal, control of education, made them the real leaders of the people. Certainly the future history of the nation was in their hands; for when the Temple was destroyed the law alone remained, and the Pharisees were the chief interpreters of the law. It was this party which claimed the allegiance of Paul. So he testifies himself. His testimony is often forgotten, or at least the implications of it ignored. But it was unequivocal. Saul of Tarsus was not a liberal Jew, but a Pharisee. Saul endorsed the martyring of Stephen, and watched over the coats of those who did the dirty work (Acts 7:58; 8:1). Luke characterized Saul as “ravaging” the church (Acts 8:3). The term used (lymaino) is a hapax meaning “to destroy.” Paul was effectively destroying the Christian church single handedly. He was “entering house after house” dragging away and imprisoning Christians. Even Ananias had heard “from many” about Saul’s violent activities against the church (Acts 9:13). So too, the Galatians “have heard” of Saul’s exploits. The phrase “church of God” (ecclesia tou theou) occurs only here in Galatians. The phrase does not refer to a particular church (e.g., that in Corinth or Rome) but the church in general. Fee rightly argues, “The popular myth that this term [ecclesia] means ‘the called out ones’ needs to be laid to rest.” By the time of the New Testament ecclesia had, partly due to the usage of the term in the Septuagint, come to refer to a congregation, assembly. For instance, the term is applied to the mob in Acts 19:32. The church of God is altogether different than the Judaism Saul so virulently followed. Saul believed Judaism and its rabbinic traditions to be completely true, and he acted out upon that belief in his violent pursuit of what he perceived to be dangerous heretical schismatics. Paul was likely regarded as a young phenom by his overseers in the Sanhedrin. He was “advancing” beyond his peers, and was recognized as having a grasp upon Judaism akin to a rabbi older than he. He was not merely zealous, but “excessively zealous” (perissoteros zelotes) for the traditional Pharisaic faith (cf. Acts 22:3). Paul was not a zealot, as with Simon (Luke 6:15), or those who were Israeli ultranationalists. However, Paul had as much zeal for orthodox Pharisaism, as did the party of the Zealots for freedom from Rome’s tyranny. He was willing to shed the blood of those who dared replace the traditions with Christ, just in the same way that the Zealots were willing to shed the blood of the Imperial soldiers who dared trample the freedom of God’s people. Subsequently, Paul’s pedigree and performance in Judaism was beyond question. The rather temperate demeanor of Gamaliel (Acts 5:38) was quite unlike that of his former student. Given Paul’s excellent grasp of the Hebrew Bible and Septuagint, he clearly learned much from his teacher. Bruce notes that “In most matters indeed, including, for example, the resurrection hope and the techniques of biblical exegesis, Paul was probably an apt pupil and faithful follower of his teacher.” Bruce further points to a section of the Talmud which mentions a student of Gamaliel who displayed “impudence in matters of learning.” Could this be a mention of Paul? It is unlikely since the student described questions certain of Gamaliel’s eschatological interpretations of certain texts. God the Father had set Paul apart before his birth, or literally “from my mother’s womb” (ek kolias metros mou). This phrase is reminiscent of the work of God among the prophets. Similarly, Jeremiah was said to have been known in prospect before birth, and set apart and appointed as a prophet (Jer 1:5; cf. Psalm 71:6; Isaiah 49:1). The implication of Paul’s statement ought to be no surprise given his understanding of divine sovereignty, election, and predestination. Like his brethren, Paul was chosen in Christ before the foundation of the world (Eph 1:4), only he was set apart for the office of apostle, and that to the Gentiles. It is not a stretch to suppose therefore, that God has set apart all his people for one work or another. Just as Paul and the prophets were set apart for the work of ministry, so all of God’s people have a divinely intended vocation. Neither Paul’s election or appointment as an apostle was predicated upon anything in Paul. Rather, God saved Paul from his sin and put him into his serves according to his good pleasure alone. Hence, Paul’s election and subsequent salvation was an unconditional one. The phrase uses the preposition dia in the instrumental sense. The means by which Paul was set apart before birth was God’s grace. God was not begrudging Paul’s salvation. Rather, Paul’s repentance from his old life brought about “joy before the angels of God” (Luke 15:10). Despite popular interpretation, Luke did not state that the joy mentioned is possessed by the angels, but rather “before” (enopian) or “in front of” the angels. Thus, the one who possesses the joy is the one who is before the angels, namely God himself. The preposition translated “to” (en with the dative emoi) is more accurately “in.” Thus “reveal his Son in me.” The preposition is instrumental and indicates the medium through which God revealed his Son not “to” Paul, but instead “in” Paul. That is, it is in and through Paul that the revelation of the Son comes (cf .Acts 9:15). Therefore, this clause does not refer to Paul’s encounter with Jesus on the Damascus road, but instead his function as the one through whom God’s truth about the Son comes. The purpose of the work of God in the life of Paul was so that he might preach Christ among the Gentiles. Imagine, a well educated, powerful, and extremely zealous Pharisee chosen to reveal the Messiah to the Gentiles! Paul was relentless in his focus upon Christ and his cross. The Son of God was the very sum and substance of Paul’s preaching and teaching. Would we not benefit from such a Christocentric approach? Whereas many churchmen become preoccupied with various subjects, Paul knew nothing among the churches but Christ and him crucified (1 Cor 2:2). The phrase “with anyone” is literally “with flesh and blood” (sarki kai haimati). Paul’s gospel and theology were given to him by God. One need not consult with God’s creatures on what God himself has purposed. This includes the apostles. As important to the church as the other apostles were, Paul did not need their approval to begin his ministry. Paul left Damascus and after having waited three years, he then chose to visit Jerusalem. Clearly, his ministry was not derivative from the other apostles. The verb translated “visit” (historesai) connotes the idea of getting to know someone for the purpose of getting information. Undoubtedly Paul was interested in meeting Peter, getting to know him personally, and hearing about his life, ministry, and experience with Jesus. In other words, the purpose of his visit was not to gain an authentication of his ministry from Peter, but instead he simply wanted to visit this important brother. James’ held a leadership role in the Jerusalem church (1 Cor 15:7; Acts 12:17; esp. 15:13), and thus he knew of Paul’s arrival in Jerusalem. The Roman Catholic myth of the perpetual virginity of Mary is shown false here. James is said to be the brother of the Jesus (kuriou adelphon) in accordance with a similar statement in Mark 6:3, “Is not this the carpenter, the son of Mary and brother of James and Joses and Judas [i.e., Jude] and Simon?” (cf. Matt 13:55; Acts 1:14; 1 Cor 9:5). While it is true that adelphos (brother) and its Hebrew synonym can at times refer to a relative who is not a biological brother (Gen 13:8; 14:12), that is not the case here. James was the brother of Jesus in the same way Mary was his mother. These texts are speaking of biological relations in the normative language. The notion that Paul’s reference is to either James the brother of John and the son of Zebedee (Luke 6:15-16), or James the son of Alpheus is problematic. James the son of Zebedee was martyred early on (Acts 12:1-4). What rationale would Paul have to especially qualify James the son of Alpheus as “the Lord’s brother?” Those who argue that James son of Alpheus is a cousin or some other relation to the Lord must also argue the incredible coincidence that his mother is also named Mary (Mark 6:3). It would be unfair to attribute his rank in the Jerusalem church simply to a veneration of one who was physically related to Jesus. Probably it is more accurate to say that his prominence came about as a result of the need for someone to lead the growing number of scrupulously minded Christians in the Jerusalem church, and that his physical relation to Jesus, his Davidic descent, and his personal qualities fitted him for the task. This sentence, after v. 18, contains the second use of “then” or “after that” (epeita). Paul’s visit to Jerusalem was among a travel itinerary, and therefore it was not a terminus. The point being, Paul’s ministry was not dependent upon the other apostles. Paul did not need a stamp of approval from either James or Peter, and when Paul did visit Peter, it was after three years of ministry. Paul’s preaching in Jerusalem, especially among the Hellenized Jews was the impetus for his journey to Tarsus, the capital city of Cilicia (cf. Acts 9:30). Bruce has noted that “the churches of Judea comprised groups of believers who had been forced to leave Jerusalem in the persecution that followed Stephen’s death, together with others who had been formed through the evangelistic outreach of Jerusalem disciples.” The Lord’s statement, “you will be my witnesses in Jerusalem and in all Judea and Samaria, and to the end of the earth” (Acts 1:8), had already begun to come to pass even as early as three years after Paul’s conversion (c. 36AD). Paul’s infamy for the violent destruction of the church was only out done by the radical nature of his conversion. God focused his sovereign grace upon the greatest human enemy of the Christian faith, making him arguably the greatest apostle in the early church. Paul went from killer and persecutor, to preacher and evangelist. Surely, this conversion must be the greatest evidence of sovereign grace ever to have existed. Paul’s conversion was not an end in itself, but rather it was the impetus by which God’s people glorified God. Only God could receive the glory for transforming the infamous Saul. A. T. Robertson, Word Pictures in the New Testament, Vol. 4, (Grand Rapids: Baker, 1933), 278. For a defense of Christ as God over all, see George Carraway, Christ is God Over All: Romans 9:5 in the Context of Romans 9-11, (New York: Bloomsbury T & T Clark, 2013). Timothy George, The New American Commentary: Galatians, Vol. 30, (Nashville: B & H, 1994), 109. Drane, J. W. Drane, Introducing the New Testament, Rev. and Updated Ed., (Oxford: Lion Publishing, 2000), 267. F. F. Bruce, Paul: Apostle of the Heart Set Free, (Grand Rapids: Eerdmans, 1973), 46. J. Gresham Machen, The Origin of Paul’s Religion, (Grand Rapids: Eerdmans, 1973), 177. Gordon Fee, Pentecostal Commentary Series: Galatians, (Blandford Forum: Deo Pub., 2011), 41. E.g., compare the Masoretic text of 2 Chronicles 6:3 with the LXX. For more on the party of the Zealots see Josephus, Wars of the Jews, 4.120. Ibid. See also Shabbat, 30b. While v. 16 indicates that it was the Father who set Paul apart, there is a significant variant reading which has “When God set me apart before I was born.” The earliest MSS, p46 and codex B, omit theos. However, the reading is present in several significant witnesses (i.e., א, A, D, etc. ), and therefore the critical editions of the Greek New Testament have included it in brackets. It is probable that a scribe included the “God” so as to clarify the subject in the place of the pronoun. Richard Longenecker, Word Biblical Commentary: Galatians, (Grand Rapids: Zondervan, 1990), 34. Schreiner, Thomas R. Schreiner, Exegetical Commentary on The New Testament: Galatians, (Grand Rapids: Zondervan, 2010), Kindle Ed., Loc. 2300-2301. BDAG, 483. See also Louw-Nida, 34.52. John Eadie, Greek Text Commentaries: Galatians, (Grand Rapids: Baker, 1979), 53. F. F. Bruce, The New International Greek Text Commentary: The Epistle to the Galatians, (Grand Rapids: Eerdmans, 1982), 103.